Sum kitteh’s daddehs du nawt hab flooff! den sum haz den hazint den haz den hazint, ai think LD reelie let hiz hayrs down wen retyrin! ah freedoms! Yur ryte, maryqos! Ai kept teh beard trimmd short when Ai waz workin, so as nawt to scare teh patients. Nao it’s onlee Mrs. Lungdoc adn teh kittehs, adn they donawt scare eezilee. I hav seen som pikshers of daddeh-hoomins who are floofy all ovur almos liek kittehs. PLEH!!! WAKS JOB, PLS! Uh, LD, ewe habz sumfing n ur beerd! nope, ai luv da idea. ai endz upp wiv litter inn mai bed. gud fing ai iz single. yeah bed lidder, how deh hek??? an ai always sai “YUK” again. heh…. 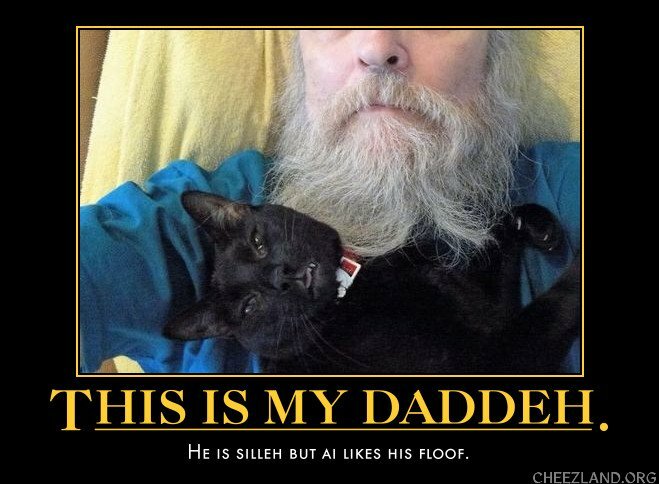 teh Skipper am a hirsute guy, too… hims kittehs lubs hims beerd. Hims old kitteh, Cujo, lubs tu bite his beerd! He kisses hims daddeh and bites gentlee awn his mustache. Iz berry funnee tu watch. Ai lubs teh beerd, axulee.. he shaves it awf sumtymes and Ai can nawt wayt fur it to gro bak. Srsly. Last time, he hada sir jury, and cut awf twenny inches of hayrs and donated hims ponytail, and shaved teh beerd. He luked like a stranger tu mee. In Cheezland, the time is 05:02.